The sponge ball is a staple in the arsenal of magicians the world over. Very few props pack the punch of the venerable sponge ball. 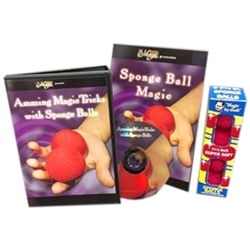 This sponge ball kit includes not only a set of four 1.5” sponge balls by Gosh, but also an Amazing Magic Tricks with Sponge Balls DVD and a Sponge Ball Magic booklet edited by Gabe Fajuri.